Dr. Subhash Kapila has written an article in Eurasia Review the theme of which is, “Afghanistan cannot be abandoned to China-Pakistan-Russia Troika”. A highly melancholic and distressful picture has been painted by the writer in a bid to remind Donald Trump Administration that Afghanistan is slipping out of the hands of the US and unless urgent and immediate measures are taken to forestall the impending strategic loss, Afghanistan would be lost for good which will have grave consequences for the sole super power. A persuasive wake-up call has been given to inviting Trump to act before it is too late. Subhash malevolently suggests that China-Pakistan axis now complemented by Russia will overturn the stability of the region. He has rung alarm bells that amidst the din of US Presidential election, Afghanistan has seemingly disappeared from the radar screen of USA and the Troika has fully exploited the vacuum to exploit it to its own advantage and to the disadvantage of Washington. He sprinkles salt on the emotive feelings of USA by lamenting that the US huge investment and loss of lives of thousands of American soldiers have all gone waste owing to double dealing of Pakistan which the US has been claiming to be its strategic ally. He warned the new US policy makers that the Troika is fully poised to seize the strategic turf of Afghanistan and thus deprive the USA of its influence in Central Asia and Southwest Asia. One may ask Subhash as to why no concern was shown by him or any Indian writer when the Troika of USA-India-Afghanistan assisted by UK and Israel was formed in 2002 to target Pakistan. 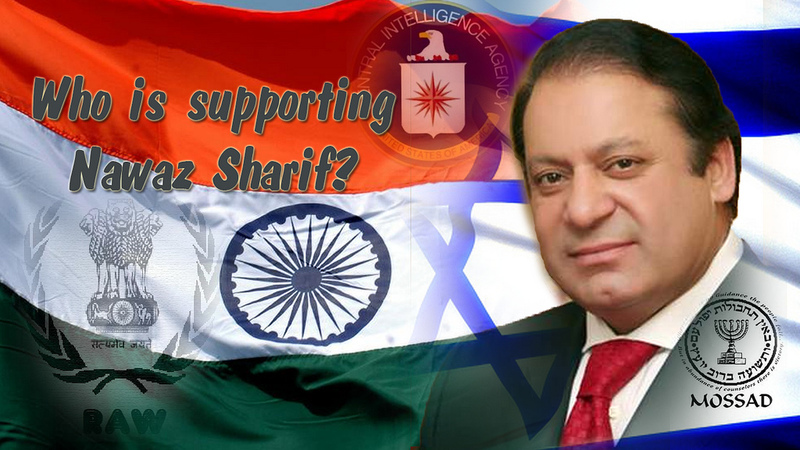 The Troika that has caused excessive pain and anguish to Pakistan and its people is still active. All these years, Pakistan was maliciously maligned, ridiculed and discredited and mercilessly bled without any remorse. The objective of the Troika and its supporters was to create chaos and destabilize the whole region which was peaceful till 9/11. India was in the lead to destabilize, de-Islamize, denuclearize and fragment Pakistan. The US installed puppet regimes of Hamid Karzai and Ashraf Ghani wholly under the perverse influence of India played a lead role in bleeding Pakistan by allowing so many hostile agencies to use Afghan soil for the accomplishment of their ominous designs. The vilest sin of the so-called allies of Pakistan was its pretension of friendship and continuously stabbing Pakistan in the guise of friends. Worst was that Pakistan was distrusted and asked to do more against the terrorists funded, trained and equipped by the Troika and was humiliated by saying that it was either incompetent or an accomplice. Driven by the desire to become the unchallenged policeman of the region and a bulwark against China, India assisted by its strategic allies has been constantly weaving webs of intrigue and subversion and striving hard to encircle and isolate Pakistan. Proxy wars were ignited in FATA, Baluchistan, and Karachi to politically destabilize Pakistan, weaken its economy and pin down a sizeable size of Army within the three conflict zones so as to create conducive conditions for launching India’s much trumped up Cold Start Doctrine and destroy Pakistan’s armed forces. India’s national security adviser has admitted that Pakistan has been subjected to his defensive-offensive doctrine to dislocate it through covert war. India’s Home Minister Rajnath Singh has vowed to break Pakistan into ten pieces. 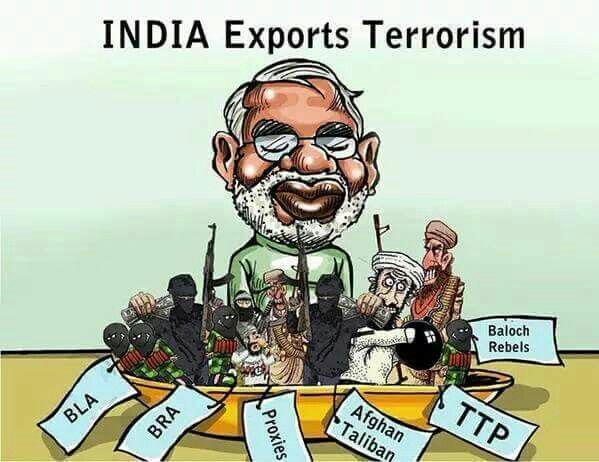 Modi has openly admitted that he has established direct links with anti-Pakistan elements in Baluchistan, Gilgit-Baltistan, and Azad Kashmir. He confessed India’s central role in creating Bangladesh in 1971 and has often stated that pain will be caused to Pakistan. This is done by way of acts of terror against innocent civilians including school children, resorting to unprovoked firing across the LoC in Kashmir, and resorting to water terrorism. Pakistan has been repeatedly warned to lay its hands off Kashmir or else lose Baluchistan. Pakistan has miraculously survived the onslaughts of the Troika and has stunned the world by controlling foreign supported terrorism after recapturing 19 administrative units from the TTP and its allied groups and up sticking all the bases in the northwest, breaking the back of separatist movement in Baluchistan and restoring order in lawless Karachi by dismantling the militant infrastructure of MQM and banned groups. Army, Rangers and Frontier Corps assisted by air force have achieved this miracle of re-establishing writ of the State in all parts of the country. Eighty-five of terrorism has been controlled. Random terror attacks are now wholly planned and executed from Kunar and Nangarhar in Afghanistan under the patronage of RAW ad NDS and supervised by CIA. Consequent to the new wave of terrorism last month, Operation Rad-e-Fasaad has been launched as a follow-up of Operation Zarb-e-Azb to net facilitators, handlers, and financiers of terrorists and to demolish sleeping cells in urban centres. The scope of this operation has been extended to all parts of the country, and all the three services are taking part in it to cleanse Pakistan from the presence of paid mercenaries and fifth columnists. Implementation of 20 points of National Action Plan is being religiously expedited to eliminate the scourge of terrorism. Afghan refugees are being returned and management of western border radically improved to prevent infiltration of terrorists. Terrorism can however not be rooted out unless root causes that heighten extremism are addressed, and the bases in Afghanistan, as well as the patrons stoking terrorism, remain operative. Pakistan has overcome energy crisis, considerably improved its macroeconomics and its stature in the world. Operationalization of CPEC, hosting of ECO meeting and holding of PSL cricket finals in Lahore have broken the myth of isolation. Pakistan has made its defense impregnable by raising the level of minimum nuclear deterrence to full spectrum deterrence. Robust conventional and nuclear capability together with stable political and economic conditions have thwarted India’s desire to attack Pakistan overtly. India and its strategic allies have been stopped in their tracks and left with no choice but to contend with covert war supplemented with propaganda war and coercive tactics to give vent to their pent-up anger. India which is the chief villain of peace is deeply perturbed and is shedding tears over its failures and loss of billions spent on proxies to detach FATA, Baluchistan, Karachi and AJK from Pakistan, or to disable Pakistan’s nuclear program. The rapid progress made by CPEC has made the deadly Troika more rancorous. Finding that its nasty game plan has run into snags with little chance of recovery, and above all Afghanistan is slithering away because of a resurgence of Taliban and ostensible insouciance of Washington, India is once again making efforts to provoke Trump and ruffle his feathers, the way it had efficaciously prevailed upon George Bush and Obama. It is now working on a new theme of demonizing so-called Troika of China-Russia-Pakistan, which is so far not in existence and is an illusion. Subhash is among the propaganda brigade selling this illusory theme and is suggesting that the so-called Troika have hegemonic and military designs against Afghanistan. CPEC is an economic venture aimed at promoting peace and friend so–called Troika have hegemony in the region as a whole. It promises goodwill, harmony, and mutual prosperity through connectivity. Both China and Pakistan shun war mongering, proxy wars and psy operations to disparage others. The duo is bereft of colonial or quasi-colonial designs against any country. Since its memo is altogether different from the imperialist agenda of Indo-US-Israel, it threatens to unravel the global ambitions of the trio. Whereas Afghanistan has not accepted the British demarcated Durand Line as a border with Pakistan and has been supportive of Pakhtunistan stunt, Pakistan has no disputes with Afghanistan and has always treated it as a brotherly Muslim neighbor. Repeated invitations to India and Afghanistan to join CPEC and reap its benefits have been turned down. Both are complacent that CPEC will be a non-starter without an inclusion of peaceful Afghanistan, ignoring the fact that they are getting isolated. Moreover, a new route from Kazakhstan via Wakhan corridor is in pipeline which will bypass Afghanistan. While China and Pakistan have jointly embarked upon the journey of peace and friendship and are attracting many countries, Russia is still hesitant and has so far not formally joined the bandwagon of CPEC which has great potential and has grandiose plans to link South Asia with Central Asia, Middle East, and Africa and eventually Europe. Russia’s hesitation is owing to the fear of losing defence and economic markets in India. However, seeing the bright scope of CPEC and motivated by its age-old quest for warm waters, Russia will sooner than later abandon India because of Indo-US military agreements and gravitate towards CPEC. Recent developments have given a loud message to India that Russia is tilting towards Pakistan. One of the reasons of Russia’s tilt is worsening security situation in Afghanistan which has turned into a big mess and is beyond the capacity of USA and Ghani regime to sort it out. Growing presence of Daesh in Afghanistan has alarmed Moscow since the declared objective of this branch of Daesh is to re-establish ancient Khorasan, which comprised of parts of Central Asia, Afghanistan, Iran, and Pakistan. The runaway TTP leaders Fazlullah, Khalid Omar and several others have tagged their names with Khorasani and have made Kunar-Nuristan as the base camp for the making of Khorasan. Russia knows that CIA, Mossad, and RAW are secretly aligned with Daesh and are killing two birds with one stone. The threat of Daesh has impelled Russia to evince greater interest in Afghan affairs and there are reports that it is supplying arms to the Taliban to enable them to tackle the new threat. Some are saying, that Moscow might intervene in Afghanistan the way it had intervened in Syria on the pretext of grappling with Daesh. If so, it might trigger a proxy war between the two big powers which will prolong the agony of people of Afghanistan as well as of Pakistan because of the spillover effect. This is exactly what India wants so as to retain its nuisance value in Afghanistan. Will Trump get enticed and blindly jump into the same inferno from which Obama had extracted 1, 30,000 troops in December 2014 with great difficulty, and lose whatever prestige the US is left with by reinforcing failure? Or else, he will stick to his policy of curtailing defence expenditure and pull out the 12000 strong Resolute Support Group and stop paying $8.1 billion annually to the corrupt regime in Kabul and inept Afghan security forces? Or he takes a saner decision by making USA part of Russia-China-Pakistan grouping to arrive at a political settlement in Afghanistan and also opt to join CPEC and improve the economy of USA? Making a realistic appraisal of the ground situation, the last option seems more viable and profitable for the USA, while the second option is dicey, and the first option will spell disaster.